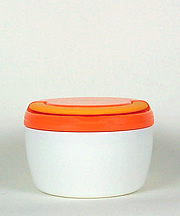 8 oz plastic insulated container with leak-proof lid and flip-up carry handle. Great for hot and cold food. Lid screws on for secure closure. Wide mouth for easy eating and cleaning. Lightweight (7.25 oz), lead-free, PVC-free, BPA-free. Approximate Dimensions: 3.5" high x 5" wide.